"I feel at home here. My house is in Fulham. Fulham is my club." Claudio Ranieri's Premier League title triumph with Leicester in 2016 was undoubtedly the greatest moment of his managerial career. It was a time when the unthinkable became thinkable - the impossible became a reality - and sealed with a slick, counter-attacking style of football that put an emphasis on defence, before ruthlessly hitting teams on the break with speed and acceleration. That exact style is what Ranieri is implementing at Fulham. It is a far cry from the theory of the previous boss, Slavisa Jokanovic, who played a more expansive, attacking brand which was far more open, creative and based on possession. Jokanovic's philosophy gained national acclaim as Fulham were promoted from the Sky Bet Championship last season via the play-offs, but it did not work in the Premier League. That's because it left them too defensively vulnerable against a higher calibre of attacking opposition - and ultimately led to his dismissal in November. That's where Ranieri stepped in and started to changed things. Fulham have won just once since the Italian's arrival, his first game against Southampton, failing to win their six games after that. However, a draw against Wolves on Boxing Day moved them off the bottom of the table - and Ranieri believes the fans are well and truly on his side as the London club make steady progress in their attempt to fight relegation. "I think they love this kind of football," he told Sky Sports. "To stay together, to stay tight and try to make our [attacks] when we get the ball. "I am always happy and satisfied. I think this system [five at the back] is much better for my players. "Yes, I think [I am settled on it]. But, of course, we can change during the match. It's important the players understand the shape, the system and what we have to do. "I think we have to improve our fitness. Because now we are used to pressing, which means you need a high level of fitness. "I have my style of training. My assistant Scott Parker follows me. In Scott, I've met a very good friend, a very good assistant." I have my style of training. My assistant Scott Parker follows me. In Scott, I've met a very good friend, a very good assistant. Fulham face bottom-placed Huddersfield on Saturday, which many fans are viewing as a must-win game. However, Raneiri is taking that with a pinch of salt, knowing that a draw would not be the worst result in the world. He is urging his players, and the Fulham fans, to remain calm. "It's crucial for us and it's crucial for them," Ranieri added. "But, as I say, if you can't win, it is important not to lose. "Taking one point is good. But, of course, playing at home, we want to satisfy our fans. "They were happy at the end of the match [against Wolves]. Of course, they are happiest with a good victory. But we need to see what we can do. We need to stay calm. "Huddersfield are a good team. They press well all over the pitch." 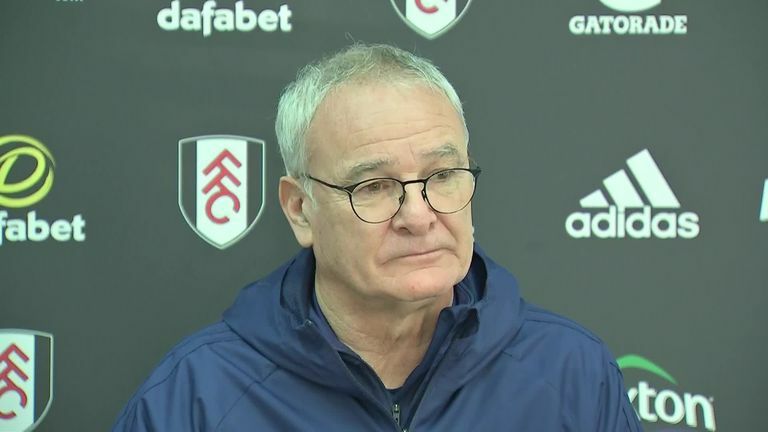 When asked how achieving Premier League survival at Craven Cottage would compare to winning the title at Leicester, Ranieri replied: "I am very, very concentrated to survive with Fulham. "You [the media] can decide if it is better or not! Of course, it would be a very good achievement.